(Newser) – "In most cases where human remains have been found in connection with … scenes of brutal violence, the bodies have been buried in mass graves. This is not the case at Sandby borg," write the authors of a new study published in the journal Antiquity. The Swedish site, found on the island of Öland in the Baltic Sea, was a once-thriving village that in the mid-fifth century was wiped out by attackers—who left the bodies to decompose where they fell. 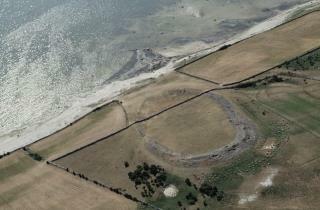 The Guardian reports that after excavations over three years, just 10% of Sandby borg, located within the walls of a ring fort, has been uncovered. Archaeologists had been warned treasure seekers were messing with the site, and for good reason: Roman gold coins, silver hair pieces, and glass beads have been found, likely left behind because they were hidden, and "no one lived who knew of them and could recover them," archaeologist Ludvig Papmehl-Dufay tells Live Science. Wouldn't you think humanity would have evolved a bit since then? Now we accomplish the same grievous ends with technology and finance. It just goes to reaffirm the words in the Bible, where it says, That Man will dominate Man to his harm. That is all Archaeologists are good for, for digging up the past, that Man would like to forget, as well as Man and History to erase the record of all Man's mistakes. Man and the god that he worships, Satan the Devil, one will perish and one will be locked up for 1,000 years. Satan will be brought back to tempt Mankind one last time, those Old and New who make the wrong choice, will be forever destroyed along with Satan and his Demons.